Implant retained dentures allow you as a denture wearer to feel more confident in your appliance and its ability to stay in place when you are eating or speaking to others. This sophisticated procedure is offered by our dentists at Thurloe Street Dental and Implant Centre to reduce the chances of your dentures slipping out of place or rubbing against the gums. The denture will clip onto multiple metal implants that are embedded into the jaw bone to create a firm and stable base for your appliance. 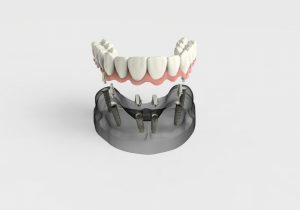 Once you have undergone implant treatment, your denture is still easily removable and your dentist will show you how to clip it in and out of place. The process for making the implant retained dentures is much the same as traditional dentures. We will take impressions of your teeth and manufacture an appliance that is individual to you. Multiple implants will be embedded into the jaw bone and left to heal. While we wait for your gums to return to health, we will provide a temporary denture so you can eat and speak as normal. At your next visit, we will provide you with the denture appliance.